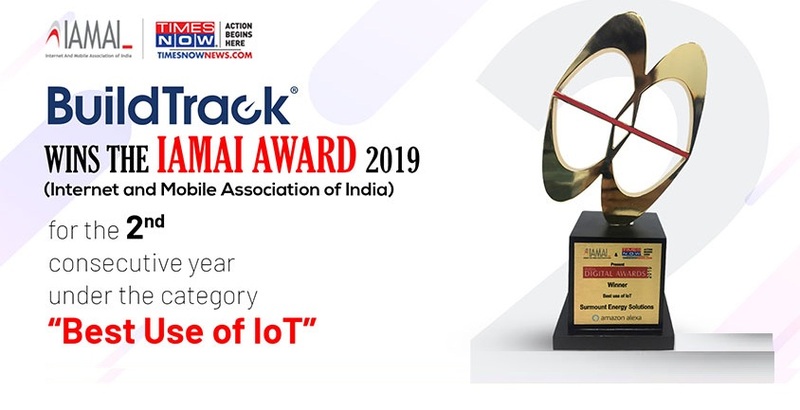 BuildTrack has won the 9th India Digital Awards 2019 by IAMAI (Internet and Mobile Association of India) and TIMES NOW for the second consecutive year. BuildTrack was awarded this under the category of ‘Best Use of IoT’. The 9th IDA award recognizes and rewards organizations, teams and practitioners who have surpassed landmarks and delivered successful business outcomes using digital as a medium. The jury had got an overwhelming 1134 entries this year for the award. BuildTrack’s IoT based Building Management System was shortlisted under this category along with companies like Bharti Infratel and Radio Logger and emerged as the winner in this category (Best use of IoT). Last year BuildTrack was also the winner of the prestigious “IAMAI Digital Awards 2018” for being India’s No.1 Smart Automation & IoT Company of the Year. The award ceremony was held on 18th January 2019 at The Lalit, New Delhi. The awards were a part of the IAMAI flagship annual event, India Digital Summit. Apart from the 8 categories, there were other special awards like The Digital Woman of the Year awarded to Smt. Aruna Sundararajan, Department of Telecommunications, Government of India by IAMAI president Dr Subho Ray. Director, Producer Karan Johar got the ‘Social Media Person of the Year’. BuildTrack BMS (Building Management System) solution is aimed at providing smart automation for buildings enabling the monitoring of various sensors of the buildings to make them safer, more secure and to provide both control and monitoring of the electrical assets of the building to improve the building operations, essentially transforming the building into a Smart Building. IAMAI (www.iamaiida.in): IAMAI conducts the India Digital Summit every year and it has been the most prominent digital event in the country. The digital world associates this event with being one of the largest annual gatherings for business leaders, industry veterans & marketers. The 13th India Digital Summit and the 9th India Digital Awards embraces the vision of Mission 2022 and the New Pillars of Digitization.